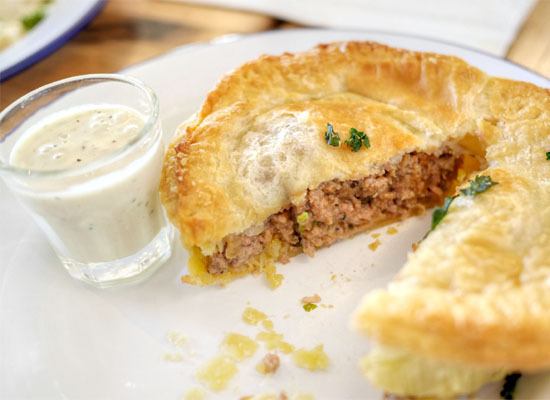 Back in Australia, meat pies are a street food staple, most often produced in bulk and sold at take-away joints. 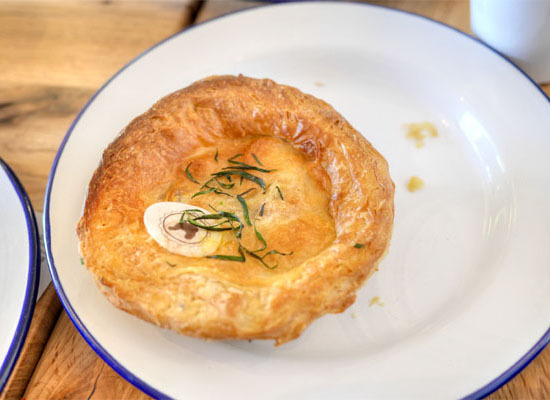 The thought behind Aussie Pie Kitchen, however, is to introduce a more elevated version of the iconic dish to American palates. APK is the brainchild of longtime marketing exec Nick Bishop and partner/love interest Geri Chua. 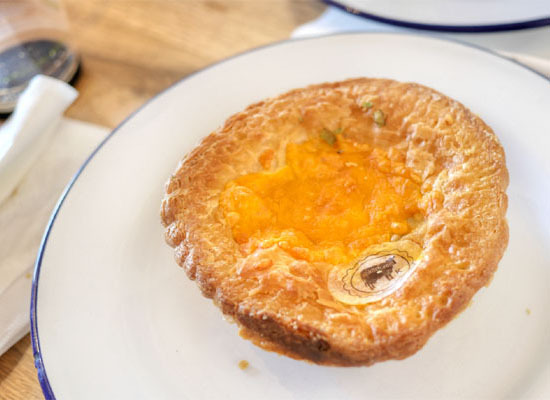 The two first started formulating plans back in late 2013, signed the lease for the old Manchego space in April last year, and debuted the restaurant in October. Directing the culinary side of things here is Joe Youkhan, a New York native and Chopped winner who cut his teeth in the Orange County food scene, having spent considerable time with David Wilhelm's Culinary Adventures group. 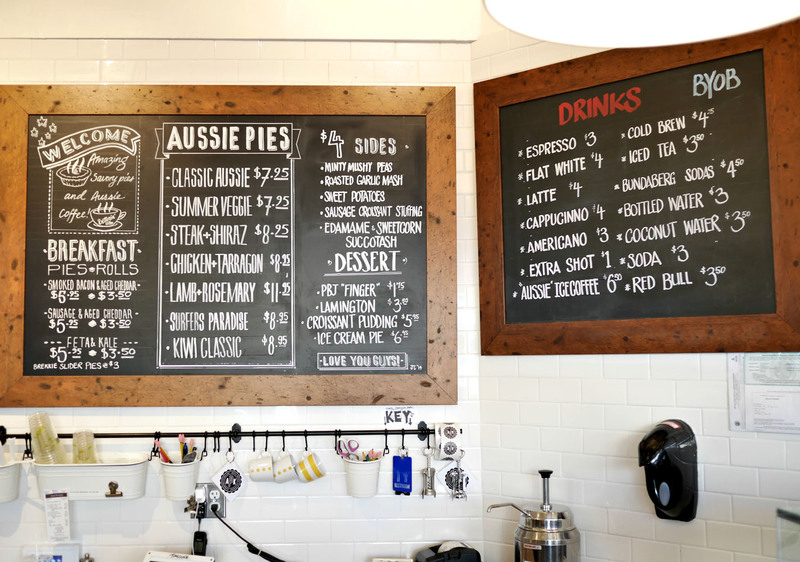 The menu currently features seven pie varieties, joined by a handful of sides that are also available as "stack" combos. Breakfast ("brekkie") pies are offered earlier in the day, and there are a smattering of desserts as well. 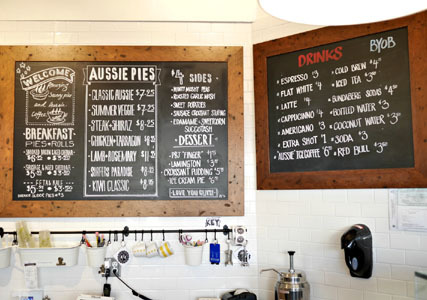 To drink, you get sundry non-alcoholic beverages as well as a surprisingly comprehensive coffee program featuring beans from Vittoria, Australia's largest producer. Click for a larger version. 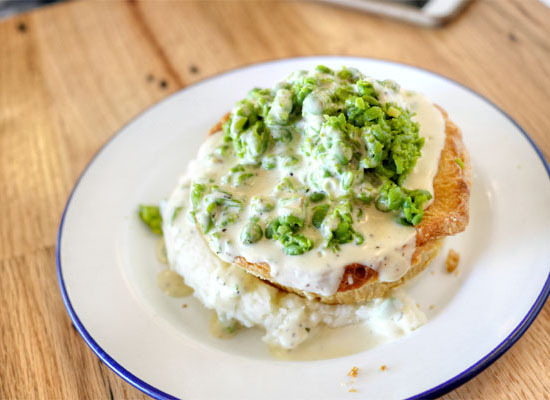 We began with a traditional steak preparation with the Tiger Stack treatment applied, which adds on Minty Mushy Peas (Peas, Shallots, Butter, Fresh Mint), Garlic Mash (Roasted Garlic Hand Mashed Yukon Gold Potatoes with butter, salt + pepper), and a splash of Creamy Thyme Gravy (Cream, Thyme, Chicken Base). 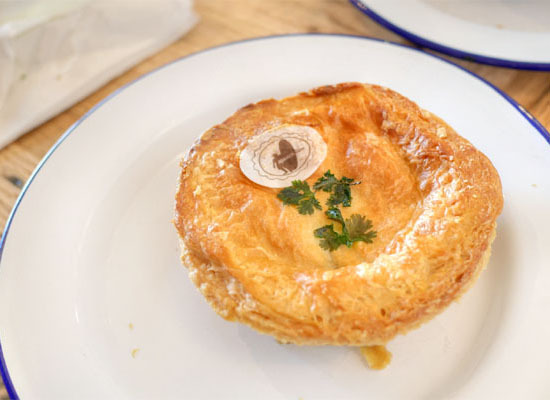 It was a homey sort of eating experience, with the tender, well-spiced chunks of meat working quite well alongside the pot pie-esque crust and hearty base of potato. 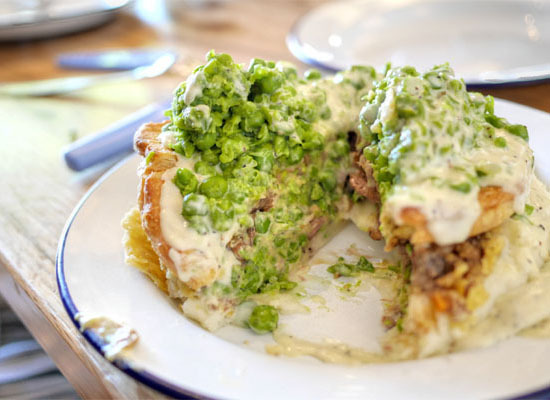 There was a lovely bit of brightness from the peas, and I appreciated how the herby sauce helped tie everything together. 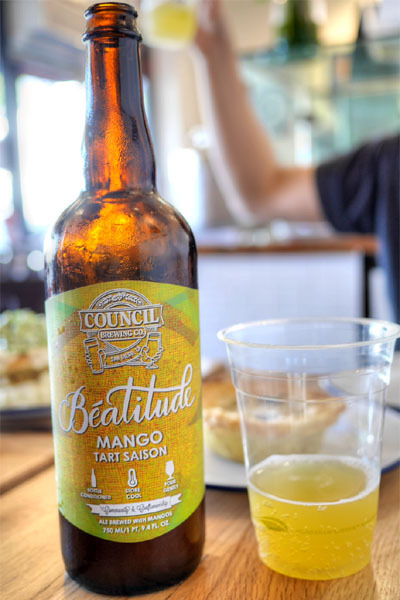 BYOB was certainly called for given the food, and up first was a bottle of the 2015 Council Mango Beatitude, a tart saison with mango. I found it super refreshing, especially on this hot day, with a sour-ish nose displaying notes of slight mango leading to tart, grainy, yeasty flavors with more of that juicy tropical fruit bringing up the rear. 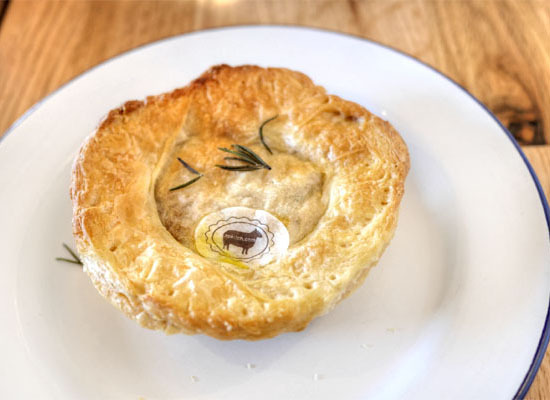 The lamb variant was a bit more assertive in terms of taste, with a punchy herbiness to it that paired swimmingly with the pie's buttery, crunchy crust (which apparently incorporates pie crust on the bottom and croissant dough up top). 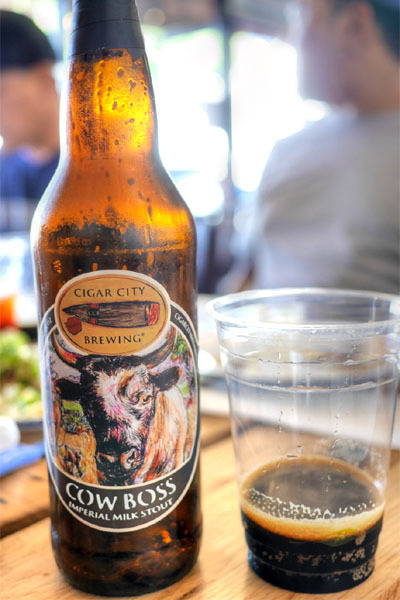 Next to drink was the 2015 Cigar City Cow Boss, a one-off imperial milk stout brewed in collaboration with the Florida Cattlemen's Foundation and aged on cypress wood. The beer was super smooth, and quite chocolate-y, with a bit of spice and coffee coming in toward the back end. The O.G. 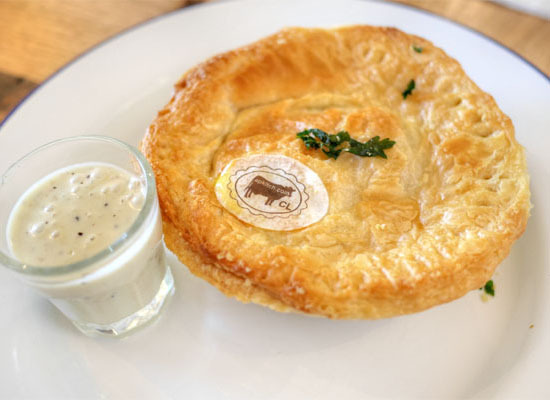 Aussie meat pie was classic at its core, with its savory, beefy flavors melding well with the creaminess of the accompanying gravy. 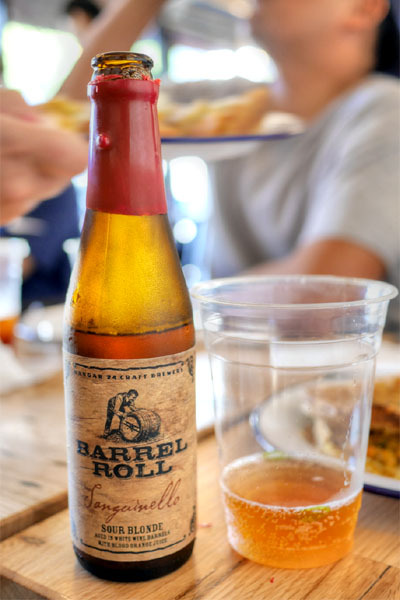 My favorite bottle this go around was the 2015 Hangar 24 Barrel Roll: Sanguinello, a limited-release sour blonde aged in Sauvignon Blanc barrels with blood orange. It was delightfully tart, and just funky enough with the sweet, aromatic kick of the fruit making itself apparent on the finish. 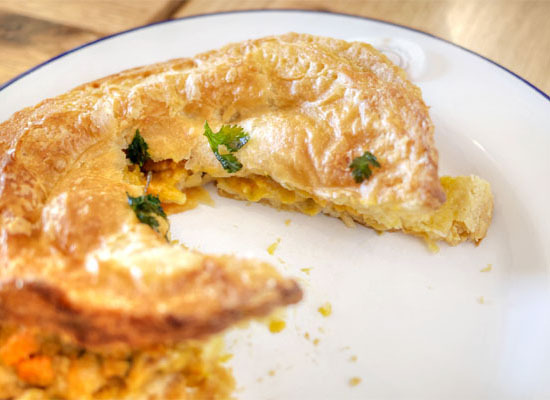 The ostensibly New Zealand-inspired variation of the meat pie added cheddar into the mix, which imparted a welcomed, further bit of heft to the dish. 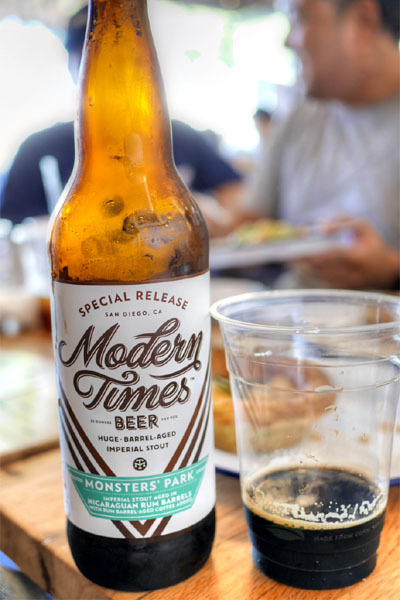 The most intense beer of the night had to be the 2015 Modern Times Monsters' Park Aged in Nicaraguan Rum Barrels with Rum Barrel-Aged Coffee, one of only 625 bottles produced. On the nose, I got super deep, super heady notes of rum spice and booze. On the palate, a different story, with the initial intensity of the barrel and alcoholic heat giving way to classic nuances of roast, chocolate, and malt, the coffee leading the way to a long finish. This was my least favorite of the pies. I got way too much citrus here, too much sweetness to go along with the curry-esque spice present. The chicken was overshadowed. 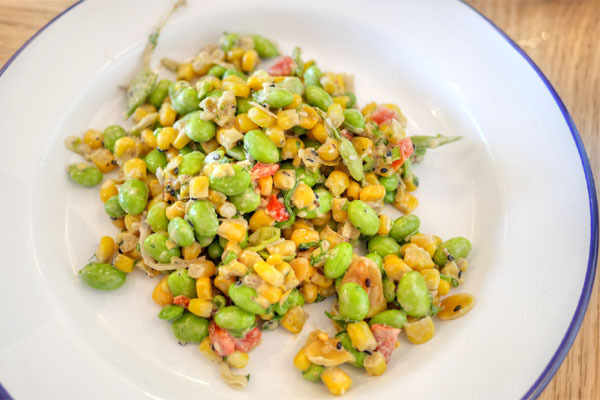 A highlight of the meal was definitely the succotash, with its bright, fresh, subtly sweet flavors and satisfying textures delivering in a big way. 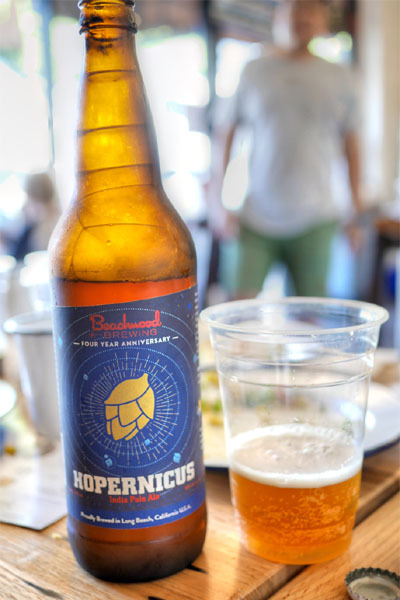 The lone India pale ale tonight was the 2015 Beachwood Hopernicus, a DIPA made to commemorate the brewery's fourth anniversary. Featuring a sextet of hops--Citra, Mosaic, Comet, Galaxy, Millennium, Equinox--the beer showed off a wonderfully juicy, tropical nose with a backbone of hoppiness. On the palate, I found it much more malt forward, with a counteracting bitterness and more citrus toward the back end. 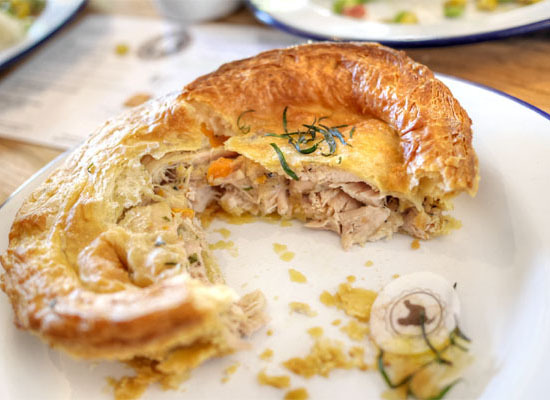 The previous chicken pie didn't allow the main ingredient to shine, so I was glad that the protein was placed on proud display here, enhanced by its marinades while the various spices and herbs worked as fitting accents. 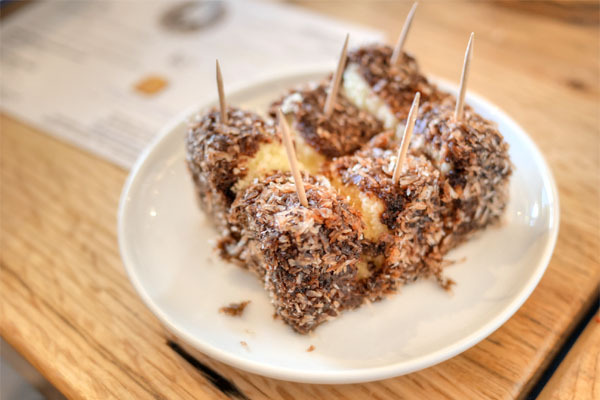 Time for the sweet stuff, and first up was APK's lamington. 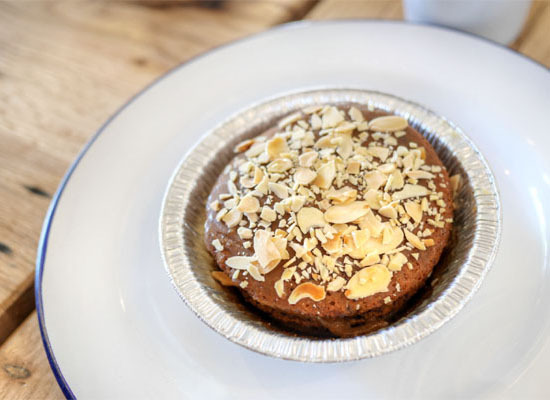 I liked it, finding the cake fluffy and moist, with a good balance between the coconut and chocolate. 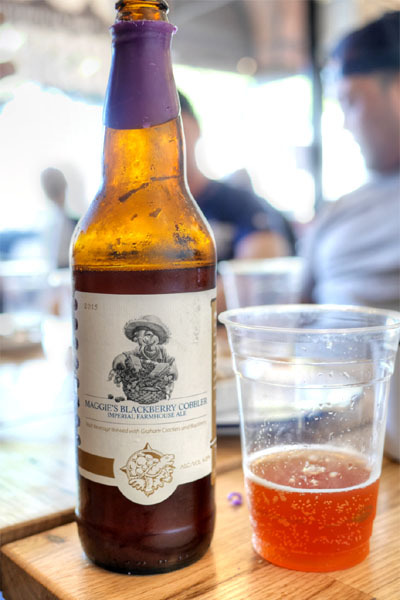 Our final bottle brought out the 2015 Terrapin Maggie's Blackberry Cobbler, an imperial farmhouse ale brewed with fresh blackberries and graham crackers. It was properly dessert-y, with massive amounts of berry pie in the aroma. The fruit continued on to the palate, though it veered a touch artificial, with the graham coming in later as a moderating element. 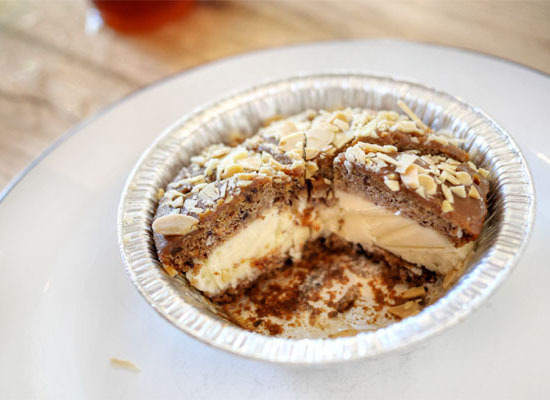 I enjoyed the ice cream pie as well, which had some lovely dark fruit and spice notes to go along with its vanilla center. 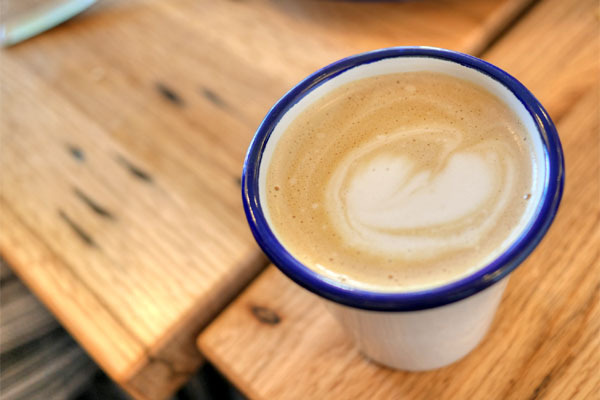 Finishing things off was a serving of Flat White [$4], an Australian invention comprising espresso topped with a layer of steamed milk microfoam. It was rather tasty, super silky in terms of mouthfeel, with a great interplay between the coffee and the milk. 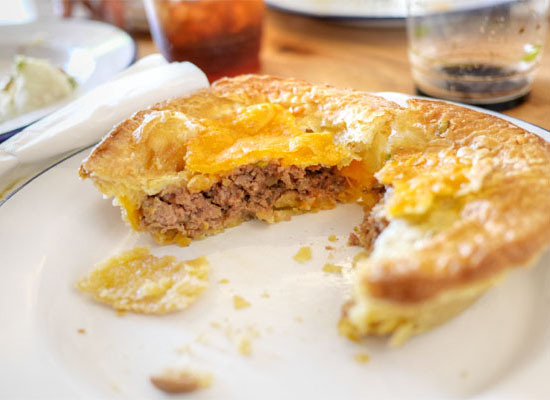 This was my first time experiencing Aussie meat pies, so I don't exactly have a firm basis for comparison (haven't been to Bronzed Aussie or Garlo's), but I did largely enjoy what I had--basically meat-centric preparations supported by buttery, flaky crusts. It's a straightforward but effective combination. People really seem to be liking the place though, as the restaurant is already in the process of expanding. They're taking over the old India Grill Express address in Inglewood (near the airport) and turning it into a small restaurant and large-scale production facility to support APK's significant catering business. This second location should be debuting in the coming weeks. It's simply scandalous that you are pouring beer of that caliber on plastic glasses, and then pretending to comment on it. Please, do justice to your beer, order a wine glass, or bring something appropriate. Great post. Those look delicious. 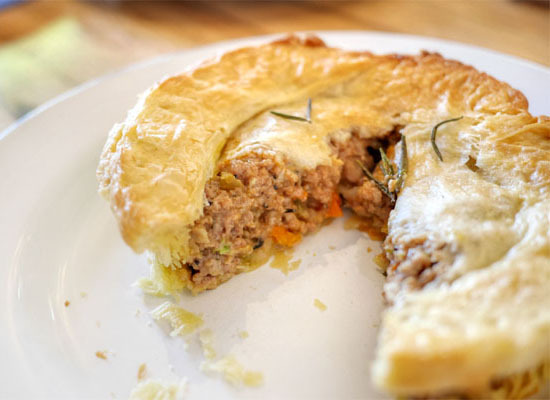 Funnily enough, this reminded me of Mrs. Patterson's Aussie Pies, of the sort you found in the frozen aisle at Costco. A childhood favorite of mine... too bad they don't sell them any more! Wow, eateries, I like this eatery.